The 1924 blockbuster that launched John Ford (The Searchers, Stagecoach, The Quiet Man, She Wore a Yellow Ribbon, Fort Apache, etc.) into Hollywood's emerging A-list of directors, The Iron Horse is an epic mythification of the American railroad's birth: a rambunctious blend of historical drama and Western actioner, revenge story and saloon comedy, noble biopic and all-bets-off tall tale. The first smash hit in the career of one of Hollywood's greatest and most enduringly popular directors: John Ford, The Iron Horse was one of the great blockbusters of Hollywood's silent era, with over 6000 extras at work on the film, it is the grandfather of all Westerns. 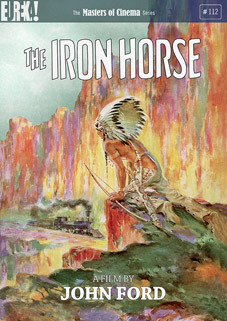 The Iron Horse will be released as a 2-disc DVD set on 26 September 2011 by Eureka as part of the Masters of Cinema series at the RRP of £20.42.